As the Blue Planet II effect took hold in 2018, the plight of plastic pollution in the oceans and marine life took centre stage as more and more scientific research came to light proving that plastic was no friend to the environment. The European Parliament voted to ban single-use plastic in a bid to help stop the pollution of the world’s oceans, seas, lakes, rivers and marine life. Read on to find out more about the EU’s single-use plastics ban. What is the EU’s single-use plastic ban? In October 2018, the European Parliament voted for a total ban on a range of single-use plastics across the European Union in an effort to put a final stop to plastic pollution of the oceans and marine life. The EU’s single-use plastic ban also included a reduction in the manufacture of single-use plastic for food and drink containers such as plastic takeaway boxes and plastic cups. The main impetus behind the EU’s single-use plastic ban is the prediction reached by scientific research that by 2050, plastic will outnumber fish in the oceans. The EU’s single-use plastic ban was originally proposed in May 2018 following an outpouring of public support off the back of David Attenborough’s BBC Blue Planet II programme, which aired in the autumn of 2017. Although it was successfully voted for by MEPs in October 2018, there are still a few hurdles left for the single-use plastic ban to go through before it can be put into effect. The European Parliament will have to enter into negotiations with the European Council once EU ministers have set their own position on the proposed ban on file. The EU is aiming for the ban to become part of legislation across the bloc by 2021. The ban was supported by 571 voted for the ban on single-use plastic with just 53 MEPs voting against it. 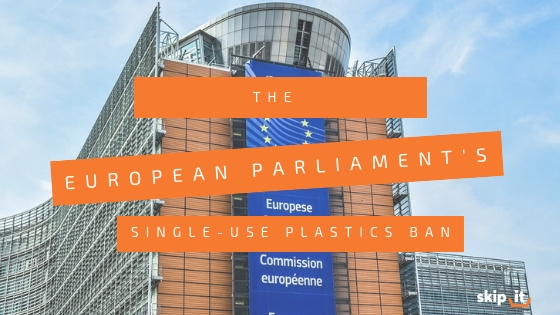 Belgian MEP, Frédérique Ries, who was responsible for the creation of the bill, commented on the success of the MEP vote: “We have adopted the most ambitious legislation against single-use plastics. It is up to us now to stay the course in the upcoming negotiations with the Council, due to start as early as November 2018. In terms of Brexit, the UK will have to incorporate this new ban on single-use plastic into national law if it becomes an actual directive before the Brexit transition period comes to an end. What with the uncertainty surrounding the Brexit agreement and Prime Minister Theresa May struggling to receive support from MPs, a lot depends on the type of Brexit the UK will get from the EU. As far as Skip It is concerned, any concerted effort made on behalf of governments, both in the UK and the EU, which promote the reduction of waste polluting the environment is a positive decision. In recent years, people have become more aware of how much waste they are responsible for producing and how this can impact the natural environment around them. At Skip It, we are passionate about recycling as much of the waste that we receive through our various waste management services as possible, from household waste right the way through to business and commercial developments and building sites. No job is too big for us. Contact our friendly team today to find out how we can help you recycle 95 per cent of your waste when you choose Skip It.